Police in Australia's New South Wales state have been given more powers to remove burkas and other face coverings to identify crime suspects. Anyone who refuses to show their face could now be jailed for up to a year or face a heavy fine. The move follows the recent case of a Muslim woman who was acquitted after a judge ruled her Islamic veil made a positive identification impossible. Islamic leaders in the state said they were comfortable with the new measure. However, civil liberty groups expressed concern that the police were being given powers they did not need. The government of Australia's most populous state approved the changes at a meeting late on Monday. "I don't care whether a person is wearing a motorcycle helmet, a burka, niqab, face veil or anything else, the police should be allowed to require those people to make their identification clear," Premier Barry O'Farrell said. He added: "I have every respect for various religions and beliefs but when it comes to enforcing the law the police should be given adequate powers to make a clear identification." 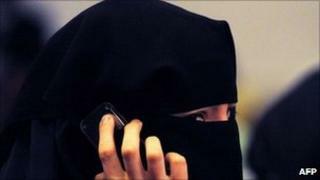 Anyone in New South Wales who refuses to remove their face covering could now be fined A$5,500 (£3,672, $5,882) or put in prison for a year. State police welcomed the change, saying it would "provide clarity and certainty for both the public and for police officers". The Islamic Council of New South Wales said it accepted the move, while the Muslim Women's Association said it had no problem if police handled the issue sensitively, including the deployment of female police officers. The changes come after the high-profile case of Carnita Matthews, who last year was sentenced to six months in prison for falsely accusing a policeman of trying to forcibly remove her burka during a random breath test. But she won on appeal after a judge ruled that the prosecution could not prove she had made the false complaint because officers were not able to see her face. State police previously had the power to request the removal of face veils while investigating serious offences, but not on more routine matters. The Western Australian state government is now also considering introducing similar legislation, the BBC's Phil Mercer in Sydney reports.